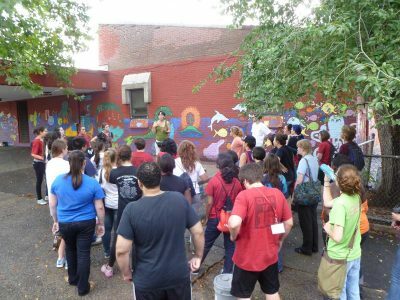 Community Service | Art Sphere, Inc.
Art Sphere Inc. helps individuals, businesses, and communities discover the potential that lies within by bringing corporations, school groups, religious groups, colleges, Boy and Girl Scout troops, government, low-income Philadelphia neighborhoods, and non-profit organizations together to benefit all participants in the service of youth. Read news story about ASI and watch video. Experience the power of creativity and teambuilding that gives back to the community. Volunteer with ASI! ASI Projects provide participants with the ability to tap into newfound expertise through team building exercises that will stimulate and energize employees and radiate benefits beyond team members into the local community. Our Community Service Events enhance community arts programs and are designed around a series of personal and team challenges. The goal is to help participants see that they can accomplish even seemingly impossible challenges (individually or together or both). We will discuss challenge, risk, effort, and anxiety as a way of helping each participant develop a greater understanding of how they respond to and overcome challenges. ASI activities strengthen your teams while giving back to the community. What difference will your team make today? Share the post "Community Service"